Note the curly one; isn't it refreshing to harvest 'real' vegetables that don't have to conform to stringent supermarket appearance guidelines! 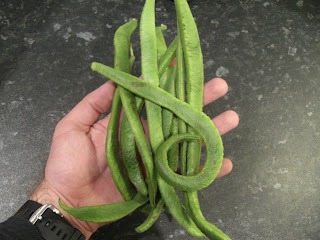 I'm harvesting about ten runner beans a week from my balcony at the moment. 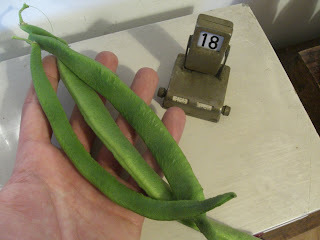 Does anyone know if they grow to a certain size and then stop, or if you can grow some truly gigantic runner beans? Tomatoes – the final frontier. Well, for me at least, they feel well and truly like an alien species at the minute! Having seen these amazing plants grow from tiny seeds over the past three months, I've been encouraged by visible progress each and every week. Now, however, we seem to have come to an abrupt standstill! Whilst I'm pleased the unbearable heat-wave of a few weeks ago has now passed, this weather unquestionably contributed to the tomatoes coming out and blooming. 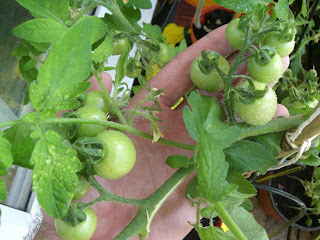 Whilst I now have an abundance of trusses and plenty of green tomatoes, they remain precisely that – green. Several gardeners I've spoken to inform me that heat will ripen these fruits. 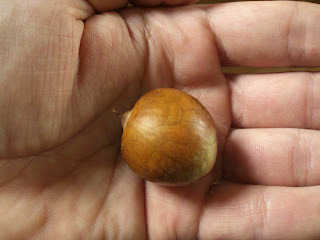 Others have said it simply takes a bit of time and that I should expect a mass-ripening come August time. Either way, these have been the most demanding plants I've grown on the London Vegetable Garden this summer – it would be a huge disappointment to come this far with no reward. Does anyone have any tips? Is patience a virtue or is there some time-honoured gardening advice to be had from you seasoned tomato experts out there? The ultimate 'end product' of growing your own vegetables, surely has to be picking something from your garden and eating it. As you may be aware, my runner beans are certainly not the prettiest example of urban vegetable growing, but recently they have started to produce plenty of small beans. The other evening, I picked off three of the biggest beans. They were delicious and the good news is, I have around twelve more runner beans growing steadily on the plants. Not bad considering I was about to throw them away the other week! Whereas last year I had only a paltry two runner beans all summer, the improved success this year, I believe, is due to the extra compost these plants have. By planting this year's runner bean plants in bottomless flower pots on top of an open grow bag, the roots have had much more room to spread and the benefits are clearly visible in the amount of runner beans I'm now harvesting. 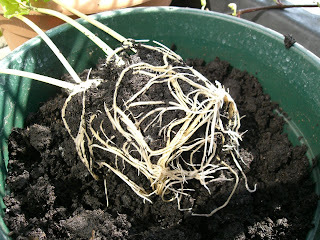 Giving your runner bean plants plenty of room for root growth. If you're growing in a pot, the larger the better. Constructing a solid pyramid cane structure. My runner beans are all along the back wall of the balcony. Whilst I am managing to harvest vegetables, the leaves are all intertwined and some I'm sure, must be choking each other. 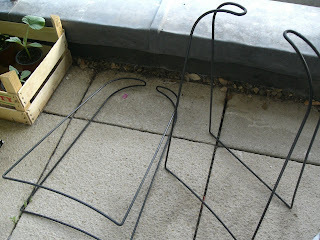 A roomy, pyramid structure gives the leaves more room to breathe and more space for the runner beans to grow properly. Water regularly. 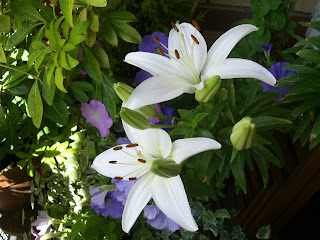 As with all balcony or container gardening, drainage is vitally important, so that the plants don't drown. My runner beans have been a thirsty plant, especially as they get bigger – don't let the compost dry out (as some is hard to re-hydrate once it's bone dry) and feed regularly. I hope these tips are useful – after all, I'm making mistakes so that you don't have to! Runner beans may be an ambitious balcony or urban garden vegetable, but they are very much a realistic, hardy vegetable to grow. If set up correctly and cared for, there's no reason why you can't enjoy some tasty runner beans throughout the summer. Good luck! Along with harvesting edible vegetables that I've managed to grow from seed, one of the most satisfying things about the London Vegetable Garden is the array of great urban gardeners I've met along the way. I spent this morning down in Columbia Road with @grumblemouse, of GrumbleGarden fame (do check out his blog – very inspiring) looking at plants and digressing over urban gardening in the capital. Along with several cups of coffee and a lively debate concerning the differences between our various tomato plants, we stumbled across a flower stall selling bulbs and both decided to purchase the fascinating looking 'cobra lily' bulb, 'Darlingtonia Californica'. Although not a vegetable, these plants were too interesting to ignore! These carnivorous plants trap and digest insects to supplement the nutrients they get from the soil – a fantastic opportunity for companion planting next to the whitefly-prone tomato plants. These fascinating lilies get their name from their snake-like resemblance; the 'hood' similar to that of a cobra, complete with a forked red leaf resembling a tongue – the only species in their genus. Clearly an intriguing plant, Grumblemouse and myself both purchased a bulb for the princely sum of £1.50 and are now having a race to see whose cobra lily flowers first! I have also decided to plant the stone from an avocado plant (pictured above), purely as an experiment to see what grows... Watch this space for updates on both of these new additions to the London Vegetable Garden! Since starting the London Vegetable Garden back in the beginning of April, my organic odyssey has produced far more than a few balcony-grown vegetables! I've seen the London Vegetable Garden Twitter account rise to a membership of over 1,200 and the blog has started to receive more and more comments as the weeks go by. There's no doubt whatsoever that there's a very real urban gardening community out there, all looking for a place to share their city gardening tips, news and stories. 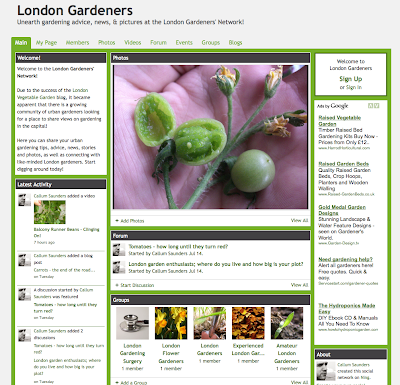 Taking this on board, I've decided to set up London Gardeners – a social networking site dedicated to urban gardeners! On the London Gardeners Network you can meet like-minded gardeners, upload your gardening photos and videos, ask questions in the gardening forum, submit your horticultural blogs and access the latest gardening news. Now, before this social gardening network site is launched to the wider public, I'm inviting friends of the London Vegetable Garden to join this site and start using it from today! Signing up is free, quick and simple. Once you're a member, you can start talking with other gardeners, loading your pictures, asking advice and getting involved. 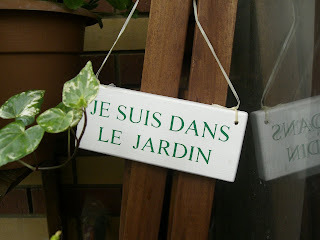 Anyone who's ever read this blog has supported the London Vegetable Garden more than they realise – the launch of the London Gardeners Network is the next step in making more people aware of urban gardening issues in London and the UK – I look forward to seeing you on there! My carrots were one of the very first things I planted when I started the London Vegetable Garden back at the beginning of April. The humble carrot is a perennial feature of the traditional English vegetable garden, so needless to say, my enthusiasm got the better of me and I planted these seeds with real relish. Fast forward three and a half months to today, and although my enthusiasm for growing carrots hasn't dampened, reality has set in. One of the main things I've learnt about growing your own vegetables over the last few months (hindsight is a wonderful thing! 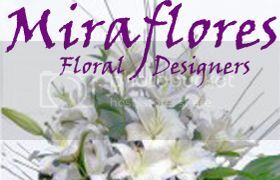 ), is that they key to successful planting in small spaces is planting thinly. Nevertheless, this attempt wasn't completely in vain! 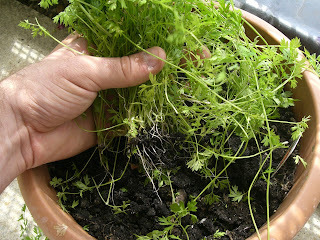 I did manage to pull out a few, albeit very small, carrots from the pot – as Darwin would argue, these do indeed indicate the 'survival of the fittest'. Whilst I'm the first to admit that this has overall been an unsuccessful attempt to grow carrots, the purpose of the London Vegetable Garden has always been to educate and to see just what is possible. 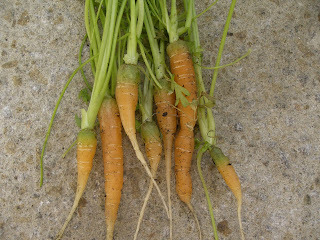 Growing carrots is possible – but be prepared to sow thinly and ideally in a very large and deep pot. One of the runaway successes on the London Vegetable Garden has undoubtedly been rocket leaves! 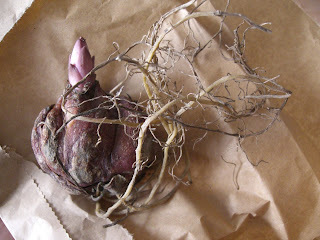 The most challenging vegetables have been root vegetables, due to the space they need in-between each individual plant. 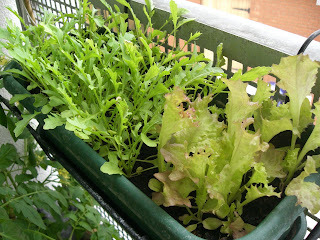 Leaf vegetables however, have produced much more successful results, due to their ability to flourish in small spaces. One of the main things I've learnt from three months of running the London Vegetable Garden project is that although planting crops in pots can be a successful method of growing vegetables, these pots need to be big. Failing this, the seeds need to be sown very thinly indeed, which I'll admit was my downfall when it came to the radishes. Gardeners with actual gardens have the luxury of deep soil and plenty of space. 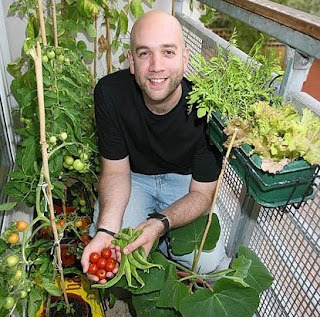 Urban gardeners in London and other UK cities that have only a balcony on which to practice their green-fingered persuasions have a finite depth of soil, usually determined by the size of their pots! With this in mind then, one of the easiest and low maintenance plants I've managed to grow since April has been salad leaves. I've used a simple window box to plant seeds (those of you that have been following me since the beginning will remember the success I had with rocket), which has proved successful time and time again. 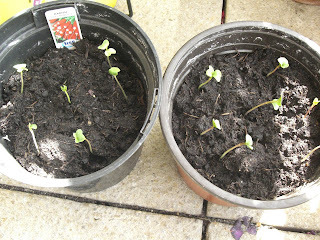 After exhausting the window box of rocket a few weeks ago, I re-planted some rocket and also some lettuce (Lollo Rossa), that came courtesy of the BBC's 'Dig In' free seeds give-away. As you can see from the picture below, this 'mix and match' approach not only offers me a nice variety of salad leaves to eat, but is also much more satisfying from a visual perspective. Many people argue that vegetable gardening is ugly, preferring to maximise their gardens with colour from various flower displays. However, if well thought-out and carefully planned, a vegetable garden can look every bit as beautiful as a flower garden, as well as providing you with plenty of splendid crops on which to feast – the beautiful colours from the lettuce paying homage to this point. So if you're feeling inspired but are not sure where to start, I guarantee you that a simple window box, some compost and a few salad seeds will yield impressive results and get you well and truly into growing your own! And if you don't have a window box, why not use an old ice cream tub or an old washing up bowl? Why not give it a go this weekend? I'd love to hear how you all get on! Grey cloud is hanging ominously in the air, the tree branches are swaying lightly in the breeze and the birds are being remarkably quiet. Add to this the fact that I have to leave the flat and go shopping at an open-air market this morning, and it seems that rain is well and truly inevitable! But nevertheless, the London Vegetable Garden sits in a sheltered spot and the continued mild weather has meant that things are still progressing nicely. 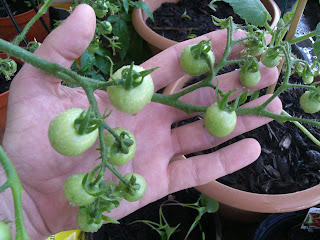 I've included some new pictures of the tomato plants. I now have a considerable amount of green tomatoes breaking out in trusses along the three tomato plants in the grow bag. 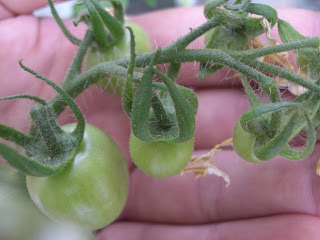 What's interesting to note however, is that these tomatoes always form one at a time, rather than a whole truss together. The tomato fruit nearest to the stem always seems to be the first fruit to bloom – I presume this is because it's the first recipient of all the water and liquid tomato plant food drawn up through the roots and the stem? Perhaps some of you more learned gardeners can tell me if my horticultural hypothesis is correct or not! Either way, many of my trusses, although with tomato fruits at different sizes, are all now beginning to flourish. 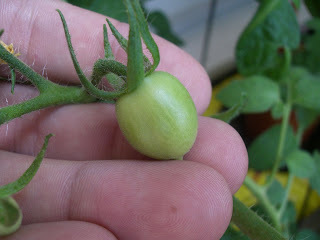 The first tomato fruits started appearing on the 1st July – a convenient date from which to start measuring! It's now Saturday 11th, so the fruits have been out for nearly two weeks; but no signs of turning red just yet! I think you'll agree, it adds a much more homely touch to the London Vegetable Garden! The campaign to open up more of London’s gardening space is finally gaining momentum it seems. 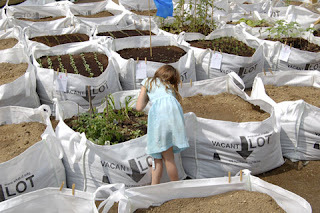 A few weeks ago, the London Vegetable Garden received news that building sites left dormant by the recession are to be turned into temporary allotments (see the article here). Needless to say, this is fantastic news for London gardeners fed up with having nowhere to grow their own vegetables and plants. London gardeners have further cause to celebrate today however, with Wandsworth council and Age Concern teaming up to unveil a fantastic new London gardening scheme. The premise is simple – adopt an elderly person’s garden and help to maintain it. As well as helping elderly residents to enjoy their garden for longer, it also presents space-challenged London gardeners with a garden to work on. 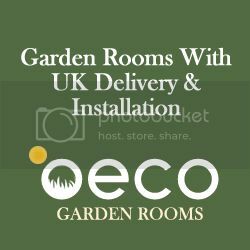 Obviously, this scheme has been extremely well received by London gardeners desperate for a plot to cultivate, but especially so amongst elderly Londoners, many of whom want to enjoy a nice garden, but aren’t able to maintain it on their own. As positive as this news is, it also serves to highlight depressing statistics for London gardeners on allotment waiting lists. Wandsworth actioned this scheme in an attempt to ease the 1,500 people that are waiting for its 607 allotment plots. And with Camden and Islington residents facing waiting times of 40 years and 25 years respectively, this story serves to show just how desperate a situation London gardeners find themselves in. Wandsworth council deserve to be praised – although we’re a long way from giving Londoners the gardening space they deserve, this new scheme shows that local governments are starting to recognise the severity of this problem and are taking small steps to remedy this – long may it continue. 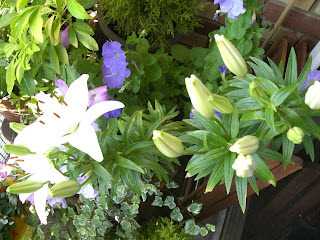 Whilst growing vegetables on the balcony is the primary focus of the London Vegetable Garden, regular readers of this blog will also know that I have various flowers on one side of the balcony. In an attempt to appease my girlfriend, who has noted that our little balcony is being overrun with tomatoes, runner beans and pots of soil, I have made a concerted effort to ensure that my gardening includes botany, as well as horticulture! There's still about twelve more heads waiting to bloom, so I'm hoping for a continuous array of lilies over the next two weeks or so. 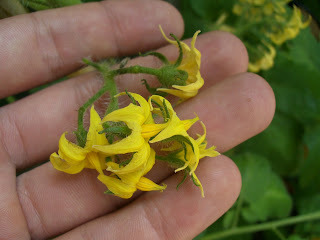 I thought it'd be quite useful to show you the various stages the tomato plants on the London Vegetable Garden have been going through when flowering. With the plants now well established and several trusses on the go, here is a visual record of how my flowers have grown into fruit. 1) The first stage – trusses form on the plant and flower. 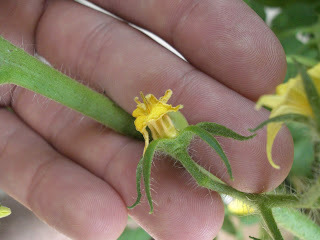 2) The flower starts to shrivel slightly and a tiny tomato fruit can be seen forming behind the flower. 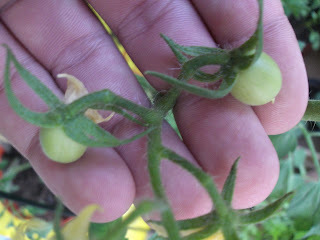 3) The tomato fruit is swelling and establishing itself quite quickly. The flower is very shrivelled up. 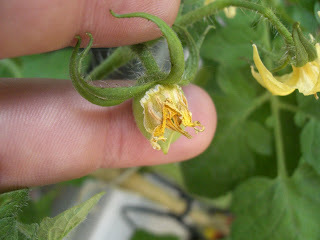 4) The flower has now dropped off completely and the tomato fruit is left to swell and grow. Now, these four photos were all taken on the London Vegetable Garden this morning, with new and old trusses showing different stages of growth accordingly. It has taken a few weeks to go from flowers to tomatoes, so if you currently have an abundance of flowers on your tomato plants but no fruit, don't be disheartened – before too long, you'll have an abundance of tomato crops growing away nicely and ready for a few salads in no time! 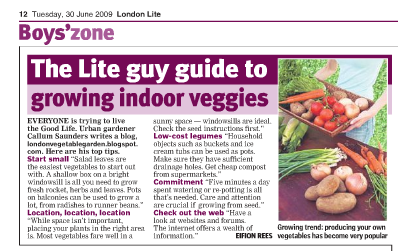 Eagle-eyed fans of the London Vegetable Garden that regularly commute, may have noticed a familiar sounding article in this Tuesday's 'London Lite' evening newspaper. I was approached by a journalist at the paper and asked to write a 'how-to' guide for growing indoor vegetables in London. Happy to help, I turned my vegetable writing efforts from blog to press for a few minutes. Although the article has been considerably cut down, it's still a great piece of publicity for the London Vegetable Garden and hopefully, it will encourage more Londoners to start growing their own vegetables, which of course, is what the London Vegetable Garden is all about! Those of you that also follow the London Vegetable Garden on Twitter (click here) will remember that I've been seeking advice regarding my leaning tomato plants. After a wealth of suggestions, it turned out that one of my colleagues at work had some devices that served that very purpose, although none of us have any idea what they're called! 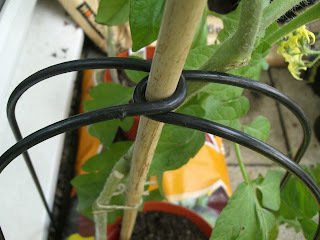 Now in place, these supports have added so much strength to the canes, and thus, my tomato plants. This hot weather has seen them shoot up considerably, which has led them to start pulling the canes down with their weight. 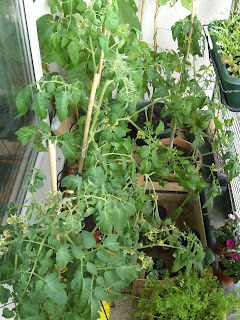 Luckily now they look a lot sturdier – as well as taking over the whole of London Vegetable Garden balcony! The recent hot weather has also been responsible for an exciting discovery I made last night – the very first tomatoes are coming through!